At its core, these six vocalists produce rock solid leads and harmonies, while exploring instrumental mimicry and creating unique textures that excite, entertain and inspire audiences of all ages. Throughout its 27 year history, Five O’Clock Shadow has redefined the possibilities of vocal music by incorporating mouth percussion, real-time digital effect processing and innovative writing and arranging into its critically acclaimed live performances and recordings. What’s more, these guys love what they do, and their joy is contagious! 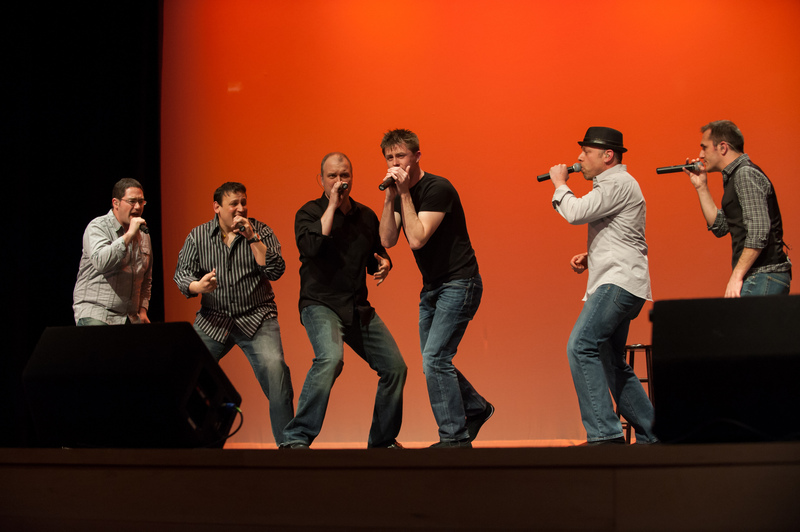 Five O’Clock Shadow effectively blurs the lines between traditional a cappella singing and today’s mainstream audio. From the United States to Europe and Asia, audiences have been witness to the revolutionary form of all vocal music that is Five O’Clock Shadow. Now you can witness it too. For booking inquiries, please email us at booking@focs.com. Download the Five O’Clock Shadow press kit (ZIP file), which includes our one sheet, group photo, and logo.